FOXX, Virginia Ann, a Representative from North Carolina; born in New York, New York County, N.Y., June 29, 1943; graduated from Crossnore High School, Crossnore, N.C., 1961; A.B., University of North Carolina, Chapel Hill, N.C., 1968; M.A.C.T., University of North Carolina, Chapel Hill, N.C., 1972; Ed.D., University of North Carolina, Greensboro, N.C., 1985; instructor, Caldwell Community College, Hudson, N.C.; instructor, Appalachian State University, Boone, N.C.; assistant dean, Appalachian State University, Boone, N.C.; president, Mayland Community College, Spruce Pine, N.C., 1987-1994; landscape nursery owner; deputy secretary for management, North Carolina Department of Administration; member of the Watauga County, N.C., board of education, 1976-1988; member of the North Carolina state senate, 1994-2004; elected as a Republican to the One Hundred Ninth and to the seven succeeding Congresses (January 3, 2005-present); chair, Committee on Education & the Workforce (One Hundred Fifteenth Congress). 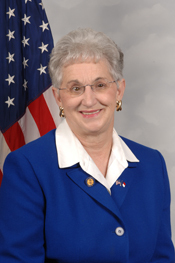 "Virginia Foxx" in Women in Congress, 1917-2006. Prepared under the direction of the Committee on House Administration by the Office of History & Preservation, U. S. House of Representatives. Washington: Government Printing Office, 2006.